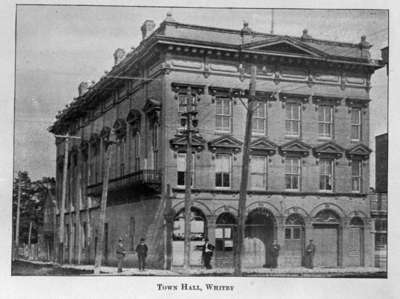 A black and white print of the Whitby Town Hall located at 201 Brock Street South. George Hopkins built a music hall on the south east corner of Brock Street and Colborne Street, 201 Brock Street South, in 1877. In 1879 the building became Whitby's town hall and served as such until 1960. The building was demolished at the end of 1960. The window at left on the main floor of the building is the office of the Keystone Press, a Whitby newspaper from 1903 to 1906. This print is made from a copy negative of a print in the Ontario County Souvenir, 1854-1904, published by the Keystone Press. Whitby Town Hall, 1904, Keystone Press. Whitby Archives 03-000-002.